For many originators in the reverse mortgage business, there are a series of tried-and-true methods that can be followed for someone to find his or her next prospective borrower. Typical examples include forging relationships with trusted advisors, meeting seniors face-to-face at community centers, or becoming affiliated with local commerce organizations. Sometimes, though, originators can find business by looking outside the box in places not typically associated with these more standard methods of tracking down new clients. For one Washington-based originator, this includes traveling to a Home and Garden show in a small rural town. Just north of Bellingham, Washington is the sleepy little rural town of Lynden, which sees a Home and Garden Show take place every year at the local fairgrounds. Because of the success she experiences in tracking down reverse mortgage business leads at the show, reverse mortgage originator Brandi Braley, with Neighborhood Mortgage in Bellingham, loves going to it. One of the reasons that Braley finds the show such a good place to generate leads is because there are rarely other reverse mortgage lenders set up there, and it gives attendees a unique chance to ask a professional about something they’ve heard a lot about but may have never seriously considered before. While many of the industry’s most typical reputational issues tend to follow her everywhere, Braley also sees events like the Home and Garden Show as an opportunity to connect with potential borrowers and to educate those who have lingering misconceptions about reverse mortgage products. 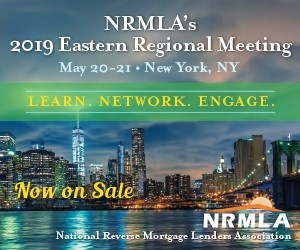 If other reverse mortgage originators have similar kinds of events in their local area, Braley encourages her colleagues to attend because of the opportunity to both connect with and educate potential borrowers. While setting up at a Home and Garden Show could likely turn into a worthwhile endeavor for a lot of originators, sometimes business leads can also come from something as small as a pen. Even though he says his wife occasionally teases him about what he spends on pens that have his contact information on them, Bruce Simmons, reverse mortgage manager at American Liberty Mortgage, Inc. in Denver, Colo., shares one instance where one of those pens turned into some surprising business. Simmons then quickly corrected himself: it actually turned into two reverse mortgages from the same borrower. Simmons also takes his outreach in the community a step further by hosting a weekly radio show devoted solely to the topic of reverse mortgages. Simmons shares that while a lot of his leads come from referral partners or trusted advisors, the radio show brings him enough new business that he counts it among one of his most regular sources of new clients. The show has also made a bit of an impact on the people who listen to it. Simmons’ presence on the radio has allowed clients to reach out to him, and he says that his regular appearances likely helps him to build credibility with people who think about taking up a reverse mortgage.